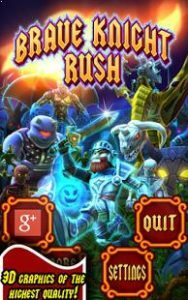 Brave Knight Rush : Ready for an high intensity action / runner / combat game? Complete all the 40 missions and fight huge Dragons and Devils Boss! Equip a variety of weapons and smash to pieces all the monstrous enemies! Ride the Dragon to defeat monsters and activate the Fireball Magic to incinerate them! 3D graphics of the highest quality and in Full HD!!! Collect coins to buy several items and power-ups in a well assorted virtual store! Supports Google Play Games: compete with players all around the world thanks to leaderboards and achievements! Supports both smartphones and tablets! Fast paced & ever changing. Love it!! Awesome game Love this game.! This is a really good game. The controls are simple and the gameplay is smooth and fun.